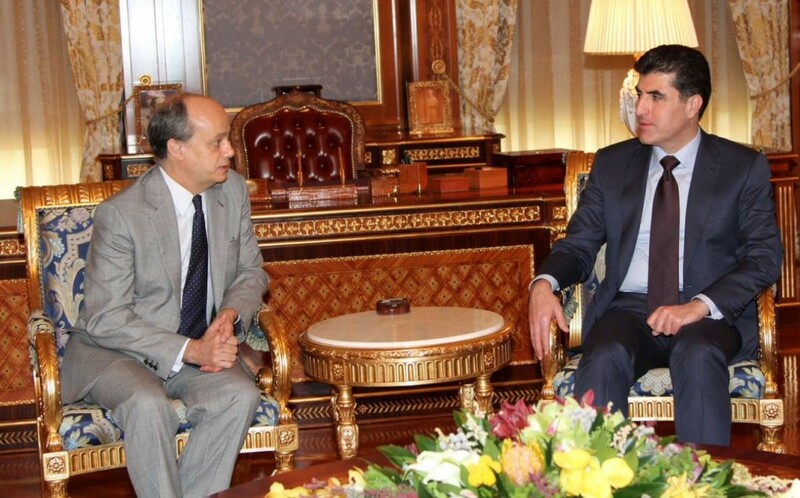 Prime Minister Nechirvan Barzani on Thursday received Jose Maria Ferri, Spain’s Ambassador to Iraq, on his first visit to the Kurdistan Region. Ambassador Ferri said that he was saddened by the current unstable security situation, but added that despite the deterioration in most parts of Iraq, Erbil enjoys peace, security and stability which he witnessed during his stay in the city. He commended the Kurdistan Regional Government (KRG) for maintaining security and stability. The meeting covered the current situation in Iraq, security in Baghdad and other areas, and the threats from the Islamic State of Iraq and al-Sham (ISIS) terrorists in the region. With regards to Spain playing a role in the international coalition against terror and the importance of the Peshmerga forces’ fight against ISIS, Ambassador Ferri said that the Spanish parliament is due to convene a special session on this issue. He conveyed Spain’s support for the Kurdistan Region and Iraq in their fight against terror. Both sides called for closer political and economic relations, Prime Minister Barzani saying that Kurdistan values its relations with Spain and hopes that Spain will play a role in the fight against terror and help the Kurdistan Region to assist the displaced and refugees. The Spanish ambassador stressed improving economic and political ties and encouraging Spanish companies and investors to come to Kurdistan. Prime Minister Barzani and Ambassador Ferri also discussed the future of Iraq, and the importance to the political process of the Kurdistan Region participating in Iraq’s new government.